Ballpark Basics: An inviting ballpark that deserves a bit of an update. Ballpark Breakdown: Founded in 1989, the Keys got their name from hometown boy and famed American songwriter, Francis Scott Key. Interestingly enough, he is buried across the street from the ballpark in a large cemetery you pass right by when making your way to the vast (free!) parking lot enroute to the game. 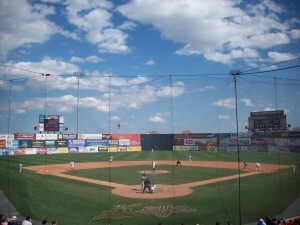 Harry Grove Stadium is named after one of the founders of the Frederick Hustlers, a professional team that started in 1915 and lasted until the World War II era. The Grove family also helped the city by donating money to help get the park built. 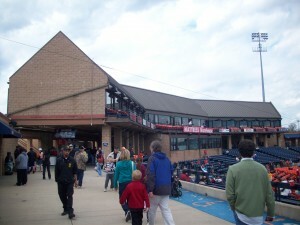 With a brick façade and brown metal roof containing a balcony that provides a glimpse of the club level, Harry Grove is slightly reminiscent of a 1970’s apartment complex from the outside. Things don’t improve greatly once you venture in – overall it is quite an unassuming ballpark. Your initial view of the field is blocked by the press box when you enter, but most of the concourse is really wide-open, affording fans ample opportunities to catch the game from multiple angles – which was truly a novel concept when the park opened in 1990. There are eight rows of orange seats that ring the field. Behind that are the general admission seats (bleacher style) down each baseline and an addition set of seats with seat backs behind home plate. There are two grass berms on each side of the field in the outfield where people bring blankets and kids play throughout the game. Also for the kids, there is a children’s section with games and a carousel on the right field concourse. And for the kid in all of us, an unusual feature (and probably an unfathomable today) is that the players locker rooms are actually at the top of the concourse, which means the players are very visible and there are lots of chances to snag an autograph or a photo opp. As with most minor league ballparks the outfield walls are covered in ads. 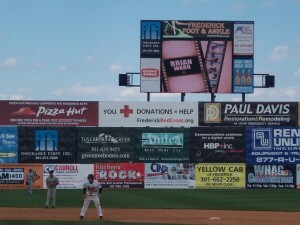 However, Harry Grove Stadium takes it to a different level with three rows of ads towering above the playing field it dominates the backdrop of the stadium. One needed update that has been completed is the newly renovated scoreboard which now contains an LED message board to announce player’s stats , pitch speed and the game line. 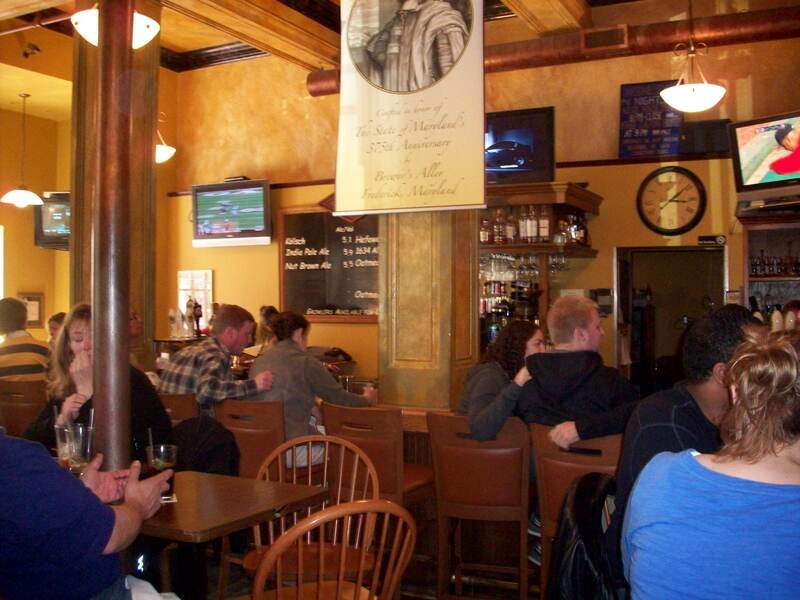 One area which they have done well with is one that is also near and dear to our hearts: beer options. On top of the usual suspects in this department, two of the three local breweries are represented at Harry Grove with Brewer’s Alley having a tent on the third base side of the concourse and Flying Dog sold out of a cart along the concourse as well. At posting time, the future of the Keys was slightly in jeopardy. 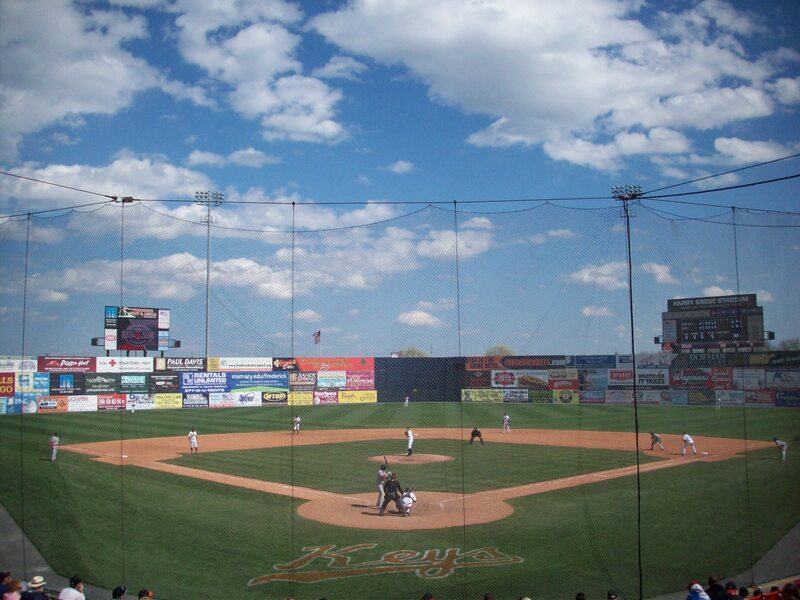 Despite numerous “Save our Keys” supporters, the city of Frederick is considering dumping the Keys and bringing an independent league team to play at Harry Grove, for purely financial reasons – an independent team would potentially pay more rent to the city to play at the same park. A gorgeous old building set right in (a surprisingly bustling) downtown. This building is all columns and marble (even on the inside), and could easily have been an old bank in a past life. With marbled yellow paint, high ceilings and creaky hardwood floors, the historic feel of this town is evident. On the Sunday we visited, it was absolutely packed, even the outside patio on what was a ridiculously windy day. We put our name on the wait list for a table, and went to hover around the bar, and were lucky to (shove some other people out of our way and) stake claim to a table. These are very hard to come by, and not just because this place is so hugely popular, but also because the space at the bar is underutilized. In designing the space they created one of the only drawbacks with Brewer’s Alley, and kept this place from being a “Grand Slam” when they kept the columns intact creating a window effect; adding a neat architectural feel, but cutting off sight lines, and more importantly several seats at the bar. They have several TV’s, all of which were tuned to various sports, but weirdly, there was bowling, there was an NBA pregame, even hockey playoffs, but they didn’t have the O’s game on (even after we requested it)…and we were barely 40 minutes from Baltimore. Our server was friendly, knowledgeable, and basically awesome even though he was very busy – and answered all the questions we tossed his way. The food took a long time to come out, but was wood fire grilled, and so delicious we were even willing to overlook that the fries are shoestring – the least worthwhile type of fry. Plus, the wait gave us time to check out the place, including the brewing area which has 2 small brewing tanks, 2 mash tuns and 3 holding tanks crammed into a tiny room – surprisingly small considering the number of beers they had on tap. Interesting note, here we came across something we’d never seen before. Brewer’s Alley provides a range for their ABV’s instead of an exact number, some wider than others. You’ll see what we mean below. Kolsch: (4.6 -5.0%) pale gold, but has definite color. Light and clean, with a hint of hops and a slightly floral finish. It is highly carbonated, but also dry. Not much if you want a sipping beer, but a good one to order if you’re thirsty. India Pale Ale: (5.0 – 5.4% ABV) this light toffee colored beer is made from a mix of malts and is a two time award winner for Brewer’s Alley. It has bitey hops, but consistent flavor – which basically means it’s mildly bitter but well rounded instead of having just a punch of taste. Also strongly carbonated, but less so than the Kolsch. Hefeweizen: (4.6% ABV)Of course we know all hefe’s are unfiltered, but this one seemed very unfiltered, if that makes sense. Cloudy beer with a thick fruit smell that is stronger and more bitter than a traditional hefeweizen in both body and aroma. Yet another beer with hints of banana that actually creates a weird aftertaste when it combines with the malts. Absolutely drinkable, but not Gillian’s favorite hefewiezen (Jim doesn’t like most beers of this style) and felt incomplete missing the typical citrus. 1634 Ale: (5.1 -5.8% ABV) a unique concept that creates an equally interesting beer. This rye beer was crafted to honor Maryland’s 375th anniversary, and is a combination of very traditional recipes, and local raw ingredients that would have been available back in the day, including molasses and caraway. The many seasonings in this brew give it a distinct spiced cider smell. This is a beer you smell strongly while you taste, much more so than other beers, but happily the taste is not that of a cider. But it is also almost indescribable. You’ll just have to order a pint of your own! Nut Brown: (5.2 – 5.6 ABV) this beer has a rich iced tea coloring and is not overpowering, but coats the tongue without being overly thick. It has a somewhat plain, traditional taste that makes it easy to drink, and the aroma smells faintly of roasted hops and even sweet almond if you know to look for it…which now, you do! Oat Stout: (6.0 – 6.2% ABV) This stout has a deep brown color and an ecru head that lasts. It’s thick and full bodied; consistent from first blush to mid sip, but then “fa-bam” something comes in from behind, that isn’t bad or abrasive, but commands attention. 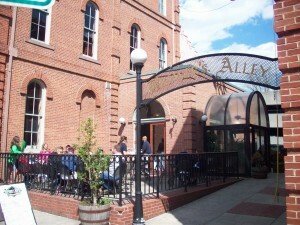 Brewer’s Alley uses mainly caramel malts in this beer to provide “residual sweetness”.